An article in the South China Morning Post covering the interview of Yoshikazu Kato, Adjunct Associate Professor of Asia Global Institute, with Francis Fukuyama, author of End of History, on the essence of government’s role, the responsibility of liberal democracy on inequality, and the spread of the "China Model" to developing countries. China’s model of authoritarian government could be an alternative to Western-style liberal democracy but only if Beijing manages to control social stresses and maintain economic stability, according to American political scientist Francis Fukuyama. The Stanford University academic’s assessment was published on the website of the Asia Global Institute at the University of Hong Kong this week. Academics have not agreed on the definition of a Chinese model but debate has intensified over the past decade over whether a mix of a market economy and authoritarian government along Chinese lines could be a viable alternative to Western liberal democracy. The assessment by Fukuyama – who in a 1989 essay forecast the triumph of political and economic liberalism after the collapse of Soviet Union and in 1992 wrote bestseller The End of History – was made public by Yoshikazu Kato, an adjunct associate professor at the Asia Global Institute, in a document that summarised email exchanges between the two from 2014 until last year. In the document, Fukuyama said his idea of the end of history had been challenged by China, which, with its authoritarian semi-capitalist system, might become the world’s most powerful country. “The issue is whether the system is sustainable over the long run,” Fukuyama wrote to Kato. “There are a number of reasons for thinking that is not [the case], beginning with the challenges of dealing with the enormous social stresses that have appeared as a result of modernisation. After three decades of economic expansion, China has emerged as the world’s biggest economy after the United States, as well as a powerhouse of global investment and trade. Chinese President Xi Jinping, who took the power in 2012, promised to achieve the “great rejuvenation of the Chinese nation” and restore the country to the status of a great power by 2049, the centenary of the founding of the People’s Republic. Chinese leaders rejected the idea of Western-style democracy and were determined to stick to their political model. Fukuyama explained to Kato that it was unlikely that countries could fully recreate the Chinese model, especially its authoritarianism, as some aspects of Communist society could not be replicated. Those included “meritocracy, a disciplined party hierarchy, respect for education, and above all, a sense among the rulers that they have a certain responsibility to act in the public interest”, Fukuyama said, referring to measures the Communist Party has taken over the past six years under Xi. 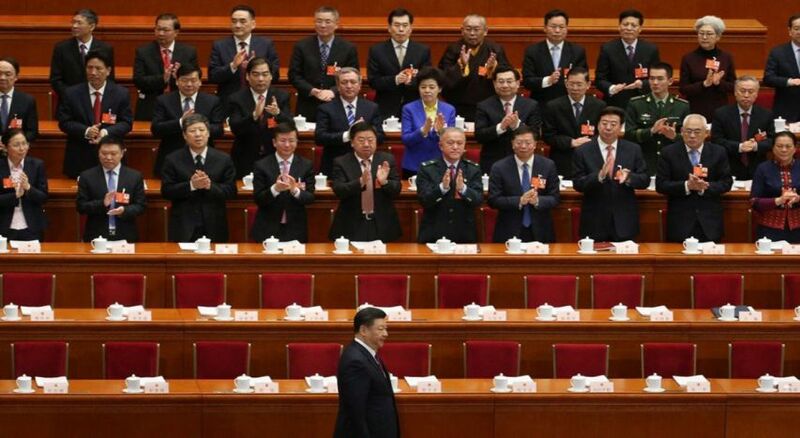 Xi’s controversial anti-corruption campaign has ensnared dozens of high-level officials within the party and the military was one, although it was unclear how well corruption had been eliminated. China’s rule of law, where the party was paramount, differed greatly from the West, Fukuyama wrote. In his 2015 meeting with Wang Qishan, who was secretary of the Central Commission for Discipline Inspection spearheading the anti-corruption campaign and is now vice-president, Fukuyama asked if Beijing could establish a rule of law independent of the party. The answer, Fukuyama went on to tell the US Council on Foreign Relations later that year, was “absolutely not”. Without the ability to keep strong leaders in check, Fukuyama told Kato, China could never escape the “good emperor-bad emperor” scenario, even when it damaged China. “In a system with a strong state but no rule of law or democracy, a good emperor can move quickly to implement policies, more quickly than in a liberal democracy,” Fukuyama said. “A bad emperor can do much more damage in such a system than in one with checks and balances”. In an opinion piece in the Washington Post in March last year, Fukuyama warned that Xi could be a “bad emperor” after China decided to removed term limits on the presidency. “As such, China under Xi may end up showing the world the unimagined forms that a 21st century totalitarian state can take,” Fukuyama wrote. He said that while in many Western countries the middle class was a force for stability, China’s large and burgeoning middle class seemed to care more about economic development rather than democracy. This, he told Kato, could pose a threat to the leadership in Beijing. “It is very hard to move from middle- to high-income status, and the question you have to ask is: how will the [Chinese] middle class feel in the face of economic stagnation, or even a setback that lowers incomes and employment?” Fukuyama said. China’s economy, which is growing at its slowest pace since 1990, is struggling with its high debt-to-GDP model and a months-long trade stand-off with the US, raising great fears for social instability among policymakers in Beijing. At the same time, competition between China and the US has intensified on several fronts, from trade to technological supremacy to the South China Sea, where Beijing’s territorial claims and its military build-up in the disputed waters are threatening to become one of the biggest flashpoints between the two powers. Fukuyama said the fact that authoritarian systems such as China seemed to be doing better economically than democracies such as the US, the European Union and Japan was the real danger to the world order, but that China could do better if it moved its rule of law away from the party and gave greater freedom to the people. “And on an international level, China should work with other regional powers to turn down the rhetoric on the issues that are dividing them,” Fukuyama told Kato. This article first appeared in the South China Morning Post on March 27, 2019. The views expressed in the reports featured are the author's own and do not necessarily reflect Asia Global Institute's editorial policy.